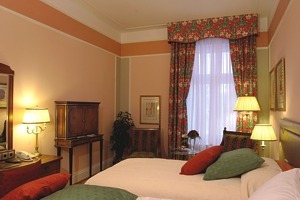 The Regent Berlin is situated in the heart of this one-of-a-kind legendary city, close to the Friedrich Strasse and because of its location it is surrounded by history. 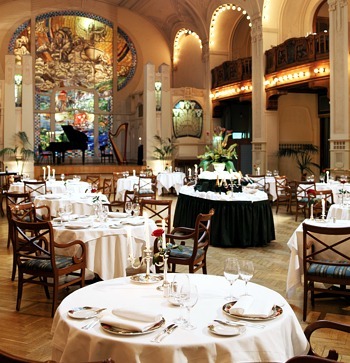 This hotel is famous for its luxurious, classic elegance, its breathtaking views overlooking the Gendarmenmarkt Square, with its magnificent 18th century cathedrals and the Concert Hall. It is just a short stroll away from the city's most famous landmarks - Unter den Linden, the State Opera, the Brandenburg Gate and the reopened Reichstag, now the seat of Germany's parliament. The personalized service we experienced 1st hand was truly outstanding. 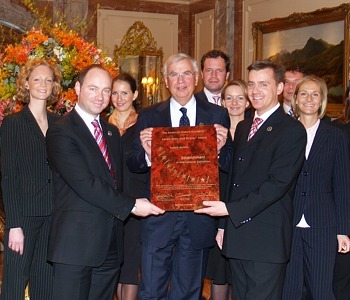 GM Wolfgang Nitschke has 50 years of global luxury hotel experience and has managed some of the world's most prestigious hotels including the Dorchester in London and the Burj-Al-Arab in Dubai. He was also part of the original team when the Regent brand was founded in the early 70's. Regent is a name synonymous with luxury and total dedication to customer service, 'yes' is the answer. 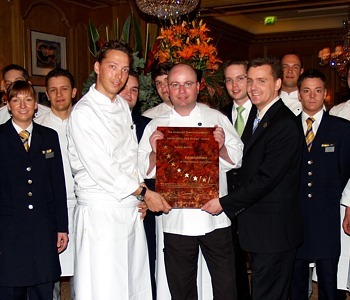 Now we were looking very much forward to be meeting with Executive 'Michelin' Chef de Cuisine Christian Lohse at the Regent's legendary Fischers Fritz Restaurant. Menus aside, it was time for Chef Lohse to get his creative juices flowing and wow us with his original plate presentations and exotic flavors. Sommelier Arno Steguweit proposed to match all our courses with the appropriate wine selections from the restaurant's extensive award-winning international wine list. A warm feeling overcame me as I gazed around the rectilinear room and I took note of the remarkable artwork on the walls and pedestals. 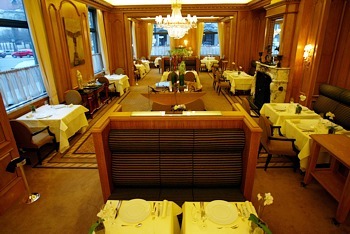 A marble fireplace accentuated the restaurant and although I had the irresistible urge to sit close by, I chose to stay fixated next to the tall windows overlooking two exceptional cathedrals and the Konzerthaus. The climax of the tasting menu was the Double Fillet of Mediterranean Red Mullet with mashed potatoes, Nyons olives and marinated tomatoes, a masterful work of art of great presentation and taste. Freshly grown basil was used to make a delicately foamed cream sauce that worked in concert to add depth and character to the creation. Sommelier Arno worked his way to the table with a bottle of Achkarren Schlossberg Grauburgunder Auslese trocken, Dr. Heger, Baden, a noble late havest pinot gris of extraordinary character. A feeling of intimacy and warmth immediately hits you as you enter the restaurant, all done in fine Russian style on an upscale level. A three-piece musical ensemble of a vocalist supported by violin and bass played softly while we were escorted to our table. The Raynaud dinnerware in black and gold lay discreetly at each place setting elegantly framed by the Robbe & Berking silverware. An open gas fireplace not only added heat at a comfortable level but also mood inducing light, dancing joyfully around our table with every flicker. Above our heads and fastened to the wall, a Faberge look-a-like lamp in the shape of the iconic Russian egg. As I glanced around the room, soaking up the environment, I noticed Dmitry Zakharchenko, the Maitre d in quiet conversation with some of the guests while opening a very chilled bottle of Ruinart Champagne. He finished and strode our way with the very same bottle and two delicate fluted glasses. This was to be our aperitif and welcome drink as well and Dmitry dutifully explained to us that Chardonnay, the dominant grape variety used in all Ruinart cuvees, was the very essence of the Ruinart taste. 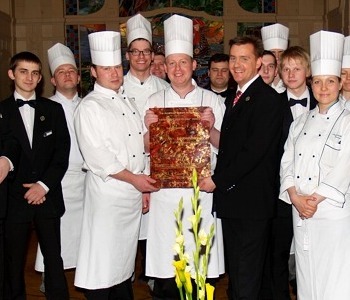 Dmitry now recommended that we let Executive Chef Yoann Bernard conjure up a tasting menu for us and we agreed. Welcome to the merry month of May, to scents of lilies of the valley and precious gems, like the emerald. May is the month of many meanings: In Finnish, it is called toukokuu, month of sowing; in Slovene, veliki traven, month of high grass. In Czech, its kveten, month of blooms, and in Japanese, Gogatsu or Satsuki, fifth month. In Chinese, the fifth month is Wuyuè. Its svibanj in Croatian, derived from the word svib meaning dogwood just to mention a few. This month we invite you on a virtual visit with us to two luxurious Seven Stars and Stripes recipients; The Regent Berlin in the legendary city of Berlin, Germany and the Grand Hotel Europe in historic St. Petersburg, Russia. We also encourage you to pick up the April issue of finest.finance! 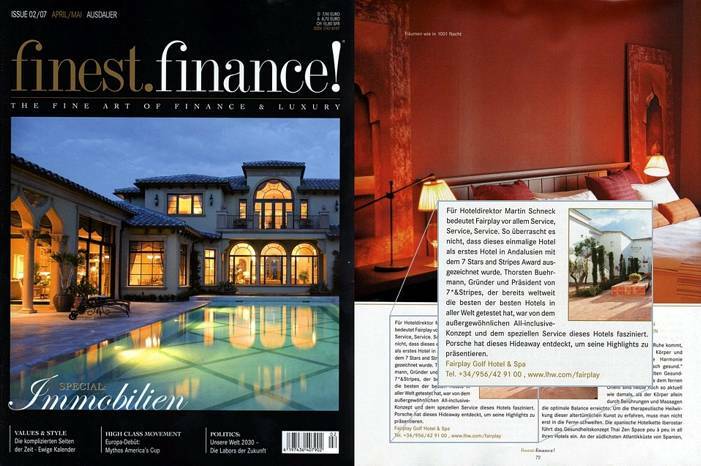 an affluent investment magazine which features the all-inclusive Fairplay Golf Resort & Spa in Andalusia as 2007 Seven Stars and Stripes award recipient. For the next issue, we are looking forward to discover the famous resort Fortevillage on the sparkling vacation island of Sardinia and we are returning to the Principality of Liechtenstein and the Parkhotel Sonnenhof, the romantic castle in the sun. And before I forget, if you are celebrating Mothers Day on May 13th, consider a one of a kind emerald diamond from the Aurora Collection for the one of a kind woman in your life. 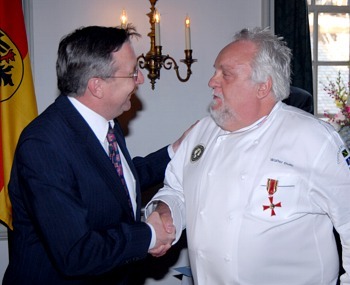 Walter Staib, Seven Stars and Stripes Culinary Advisory Board Member & Member Trustee of the Culinary Institute of America received the Knights Cross of the Order of Merit of the Federal Republic of Germany from the hands of Consul General Dr. Hans-Jürgen Heimsoeth on April 23rd, 2007. The ceremony took place during a reception at the City Tavern restaurant in historic Old City Philadelphia, USA. In recognition of his outstanding contributions to the nation in the field of social, charitable and philanthropic work the decoration was bestowed upon Mr. Staib by the President of the Federal Republic of Germany, Horst Köhler. 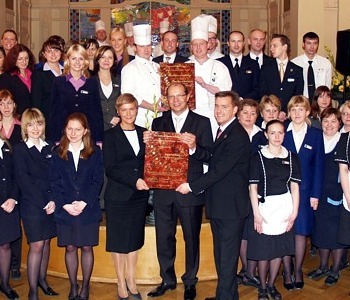 Located in the heart of the fascinating city for over 130 years the Grand Hotel Europe is playing an important role in the life of St. Petersburg and most certainly 'Mother Russia'. This easily identifiable, cultural and culinary institution is renown throughout the world. 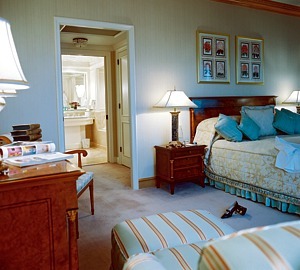 Celebrities, heads of state and royals are choosing the Grand Hotel Europe with its elegant 19th-century historic charm while appreciating the well designed and integrated 21st century facilities. Many hallways leading to our accommodations were obviously newly appointed and re-decorated with fine antiques and art, which we were able to admire before we entered the Historic Floor. The obligatory welcome silver tray with Beluga caviar, blinis and ice cold vodka never fails to amaze me and it grabbed my undivided attention once again, though I skipped the blinis and the side dishes. Later I met with the 'Couple of the Year' - GM Thomas Noll and his beautiful wife Tanya. Noll is known for surrounding himself with experienced and progressive hospitality professionals by focusing on outstanding service, quality and unwavering attention to detail. It is evident that GM Noll believes in natural materials for his furnishings; the colors are quite attractive and designed to conceal the sophisticated lighting, adding a touch of warmth and coziness. 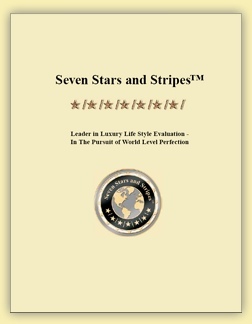 Noll and his wife, both world travelers, returned the very same day from London to receive the well earned Seven Stars and Stripes award 2007. Svetlana Sukhorukova our smiling hostess beckoned us and moved gracefully towards us. Our 2006 Seven Stars and Stripes Award Plaque greeted us on a wall adjacent to the entrance. The glorious baroque chamber music wafted throughout the Art Deco interior as if a meandering rivulet in a pristine forest. All the elements for a gratifying evening were in place and ready for the capable hands of Executive Chef Yoann Bernard to demonstrate his culinary prowess. A spirited Maitre d by the name of Dmitry Zakharchenko, who is a member of the famed La Chaîne des Rôtisseurs, offered to guide us to our table. 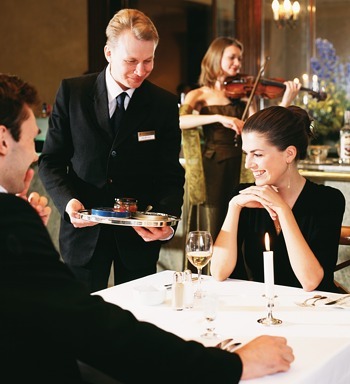 It was Dmitry, who assisted us on a previous visit to the LEurope and under his watchful eyes, we were able to dine elegantly and enjoy the imperial splendor of exceptional and personalized Russian service. Of special note was the next course of Chilean Sea Bass, Provencal with green asparagus, fennel and lemon confit together with sweet and sour beetroot sauce. The large tender white flakes of sea bass sat side by side with the lemon and fennel confit, which was cooked to a jam-like consistency and served as accompaniment. The sea bass was paired with a wine selection of Pouilly Fumé la Demoiselle de Bourgeois", Henri Bourgeois 2004, a smoky wine of extraordinary depth of character, hence the name, Fumé (French for "smoke"). This wine is tart, crisp and grassy which is accomplished by using Sauvignon Blanc as the sole grape.